Established 2002 and located in Minnesota, USA, SF Planet specializes in electronic accessories. We carry Vena, GreatShield, Fosmon, FosPower & JuzPetz products. - Xbox One. - USB Type C. Deals subject to change without notice. Compatible Platform: Xbox 360, Xbox 360 Slim. Includes: 2 Xbox 360 Extension Cable. Reach across the largest of rooms without worrying about batteries or wireless connectivity. Current Generation. Last Generation. 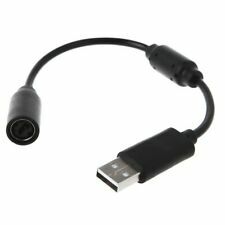 Compatible with for Xbox for 360 & any other gaming devices that utilize breakaway connections. Protects the Xbox unit from “trip & smash” accidents. Item Type: Adapter Cable. Cable Length: 25cm (9.84in). Compatible Platform: Xbox 360, Xbox 360 Slim. Includes: 2 Xbox 360 Extension Cable. Reach across the largest of rooms without worrying about batteries or wireless connectivity. Length: 6 ft. It fits any corded accessory, including Rock Band guitars. Dual color indicator to show the charging state Included: 1 X USB Charging Cable. Charging cable length: 1.5 m approx. Color: Black. Work temperature: 0-70 Centigrade. Warranty Service. If item is defective after 3 months, you can still send it back to us. New generic USB Charging Cable for Microsoft Xbox 360 Wireless ControllerCharges your XBOX 360 wireless controllers through any USB portCompatible With Microsoft: Xbox 360, XBOX 360 SlimCable Length: Approx. 180cmQuantity:1100% Brand New and high qualityUSB cable allows you to charge your Microsoft xBox 360 Wireless Controller while playing gamesNever runs out battery again while you are about to strike your final scoreType: genericAccessory ONLY, Wireless Controller not includedColor: GrayPackage Contents:1x USB Charger Power Cord Cable For Microsoft Xbox 360 Wireless ControllerNote:Light shooting and different displays may cause the color of the item in the picture a little different from the real thing.The measurement allowed error is /-1-3 cm. .
1x AV Cable for Xbox 360 E. For the sake of the security and integrality of the arrival of the product, we suggest that you could select it. Product Related. Never runs out battery again while you are about to strike your final score. Cable color: Grey. Third party product, not made by Microsoft". Cable length: 150cm. Compatible with gaming devices that utilize breakaway connections. This breakaway cable is compatible with Xbox 360 Rock. Dance Pads & any other gaming devices that utilize breakaway. devices that utilize breakaway connections. This breakaway cable is compatible with Xbox 360 Rock. Dance Pads & any other gaming devices that utilize breakaway. 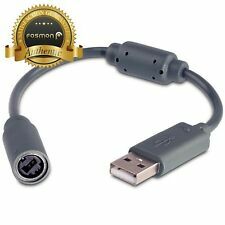 1 x Xbox 360 USB Breakaway Cable. devices that utilize breakaway connections. To prevent your Xbox 360 from Crashing onto the floor. Included: 1 x USB Converter Cable for Xbox 360. If item is defective after 3 months, you can still send it back to us. We will send you a new one after receiving the defective item. Warranty Service. Compatible with gaming devices that utilize breakaway connections. Easy to connect and disconnect. Ferrite bead protects against RF and EM interference. We are committed to resolve all issues in a friendly andsatisfactory manner. SHIP FROM USA Replaces faulty or used breakaway cable with this new one. Compatible with Xbox 360 wired controller and connects easily. Features great build and finish quality and allows to play games without running out of batteries. Note: Xbox controller not included; Non-OEM Accessory. Brand Unbranded MPN Does Not Apply UPC Does not apply. Dual color indicator to show the charging state:Lights red-Charging; Lights green-DoneNOT compatible with: Microsoft Xbox, Xbox One. Cable Length: Approx. 1.46m / 4.8ft. Color: White. 2 USB Breakaway Cable Cord Adapter For Xbox 360 PC Wired Controller. Condition is Used. Dual color indicator to show the charging state:Lights red-Charging;Lights green. Cable Length: approx 1.79m. Work temperature:0-70 Centigrade. This can be for any of the following reasons -. Original box: NO. Dual color indicator to show the charging state Included: 1 X USB Charging Cable. Charging cable length: 1.5 m approx. Work temperature: 0-70 Centigrade. Warranty Service. If item is defective after 3 months, you can still send it back to us. This adapter cable is simple and easy to connect and disconnect. - Compatible with gaming devices that utilize breakaway connections. - Ferrite bead protects against RF and EM interference. Type: for XBOX360. Included: 1 X Charging Cable. Specification: 2.75m/9.02ft. Wire material: PVC rubber. If item is defective after 3 months, you can still send it back to us. We will send you a new one after receiving the defective item. Features: 100% brand new with high quality Compatible with Xbox 360 wireless controller. Pure copper, featured with fast charging experience You can charge your wireless controller while playing games Charging while playing, never runs out battery again while you are about to strike your final score. Load the battery in your controller before you charge it. Dual color indicator to show the charging state 1 X USB Charging Cable. Charging cable length: 1.5 m approx. Work temperature: 0-70 Centigrade. Color: Black. Dual color indicator to show the charging state:Lights red-Charging;Lights green. Cable Length: approx 1.79m. Work temperature:0-70 Centigrade. This can be for any of the following reasons -. Color: Gray & White. Features: Condition: New Dual color indicator to show the charging state: Lights red-Charging; Lights green-full charged Specification: Work temperature: 0-70 Centigrade Work voltage: DC 5V Weight: 61g approx Color: Black Charging cable length: 1.5 m approx Included: 1 X USB Charging Cable. USB Breakaway Cable Compatible. Simple and easy to use; just plug in! Xbox 360 Rock Band Guitar Hero Drum Dance. Will not clash with your existing cable color. OFFICIAL Xbox 360 Play And Charge Cable USB Controller Charger Cord Plug N' OEM . Condition is Used. Shipped with USPS First Class Package. 1 USB Charging Cable. Notes: The real color of the item may be slightly different from the pictures shown on website caused by many factors such as brightness of your monitor and light brightness. Work temperature: 0-70.